We are certainly not rug experts, but carpet shops have always had a great fascination for us and it's hard to leave without purchasing something: and always something wonderful! All of these carpets are new and as a result they are reasonably priced and have the added benefit of being able to lie flat on the floor. Three GLAOUA rugs are shown on this page. The carpets are made in villages in the High Atlas mountains. 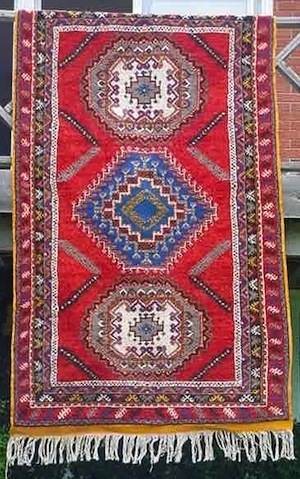 Glaoua carpets typically incorporate three techniques within the same piece, and show alternating bands of flatweave, hand knotted pile and twisted fibre. Modern rugs also have embroidered patterns on some of the areas of flatweave and often have central "feature" strip. Cotton forms the backing for the carpets and dyed sheep wool is used for the weaving. The work is done by hand and is almost always performed by women. This carpet, and the one above are similar but the differences become more obvious on closer examination. They are almost the same size, but the distribution of colours varies considerably. Size: Size: approx. 5ft 3"'x 8ft 3"
This carpet was made in the mountains surrounding the small town of Tazenakht in the High Atlas, south of Ouarzazarte home of the Moroccan film industry. Three medallions with elaborate borders sit on a rich red background. Layers of complex pattern surround the entire carpet. The centre medallion is a strong blue with white and chestnut details. This is flanked by two white medallions with fawn and grey motifs. The carpets have a fringe at only one end. The other end of the carpet has short loops of cotton where the weft was stretched over the weaving frame. Size: 4ft 9" x 8ft 2"